Aromatherapy has been used for thousands of years by the ancient Egyptians and the Roman Empire, for embalming, preserving, medical and cosmetic purposes. Essential oils such as cedar, myrrh were used for embalming and jars of Frankincense and styrax have been found by archaeologists in tombs dating from 3000BC. The antiseptic and antibacterial properties of these oils would help to prevent dead bodies rotting. 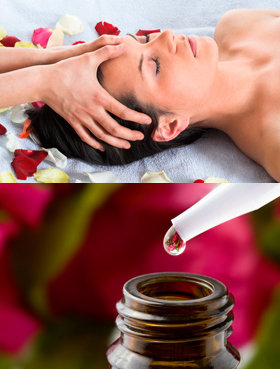 Aromatherapy is the use of essential oils in holistic treatments to improve physical, emotional and mental well being. Essential oils, extracted from plants, possess therapeutic properties which can be used to improve health and prevent dis-ease. They have both physiological and psychological effects, when combined promote balance and positive health. These natural plant oils are applied in a variety of ways including massage, baths, footbaths, compresses, vaporizers and inhalations. They are absorbed through the skin and are especially effective with stress-related conditions and a variety of other conditions. There are two ways in which essential oils can safely penetrate the human body. One is smell/inhalation, through the nose and the other is absorption, through the skin. When essential oils are absorbed by smell/inhalation, the oil molecules travel up the nose and send messages to the brain and nerves which respond to the smell, also they pass into the bloodstream via the respiratory system. When absorbed via the skin the tiny molecules of an essential oil enter the bloodstream via tiny pores, hair follicles and sweat glands, once the oil reaches the circulatory system it is then transported around the body. How can it help ?